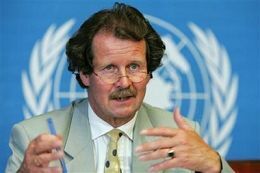 ﻿ U.N. Special Rapporteur on Torture: Regarding the Persecution of Falun Gong, "Nothing Seems to Have Changed for the Better"
On August 5, 2009, Dr. Manfred Nowak, the U.N. Special Rapporteur on Torture, was interviewed by The Epoch Times newspaper, and he talked about the persecution of Falun Gong in China. "Nothing seems to have changed for the better," Dr. Nowak told the Epoch Times reporter about the current situation of Falun Gong practitioners persecuted by the Chinese Communist regime, "The majority of the inmates in these [forced labour] camps were Falun Gong members. And that is so frightening, because none of these people were ever given the benefit of a trial. They were never charged." "Moreover, in many cases, their detention and/or forced treatment are not subject to judicial review. For instance, at the time of the Special Rapporteur's visit to China, 'enforced drug rehabilitation' programmes were a specific form of administrative detention." In a 2005 trip to China, Dr. Nowak discovered that two-thirds of the torture cases in labour camps were Falun Gong practitioners. The Chinese Communist regime not only carries out the measure of the "enforced drug rehabilitation" programs on Falun Gong practitioners in prisons and labour camps, but they also send healthy and normal Falun Gong practitioners to psychiatric facilities or drug rehabilitation centres. Moreover, they force Falun Gong practitioners' family members to inject them with psychiatric drugs at home. Statistics indicate that cases of Falun Gong practitioners being persecuted with 'psychiatric treatment' have spread to 23 out of 33 provinces, autonomous regions, and municipalities under the direct leadership of the central government in China. At least 100 psychiatric facilities at the provincial, city, county or district level have engaged in the persecution. Based on the number and distribution of these cases, it is clear that the abuse of psychiatric drugs on Falun Gong practitioners has been a well-planned, systematically carried out, top-down policy. Normal, rational, and healthy Falun Gong practitioners have been unlawfully locked up in psychiatric facilities. Many of them were forcibly injected or force-fed numerous drugs capable of destroying someone's nervous system. These Falun Gong practitioners were also tied with ropes and tortured with electric shock. The unknown drugs have caused some practitioners to suffer from partial or complete paralysis. Some have lost their sight or hearing. Some have experienced the destruction of muscles or internal organs. Some have lost part or all of their memory and become mentally disabled. The internal organs of some practitioners have been severely injured. Some have suffered complete mental collapse. Some even died shortly after being injected with the drugs. Consistent exposure of the persecution of Falun Gong practitioners has attracted international attention. During the 41st session of the annual meeting of the UN Committee Against Torture from November 3 to 21, 2008, the CCP's drug torture and compulsory psychiatric hospital detention was discussed. The annual report, which summarized this session, was also sent to committee members, including China. Most influential mainstream media such as the Associated Press, Reuters, Agence France Presse, Central News Agency, New York Times, Radio France Internationale, Voice of America, New Zealand television, Canadian news, Voice of Germany and others, filed reports on this situation.